The Blackboys Inn had been recommended to me by lots of friends so when my brother and his family were visiting for the weekend we booked in there for a Sunday roast. 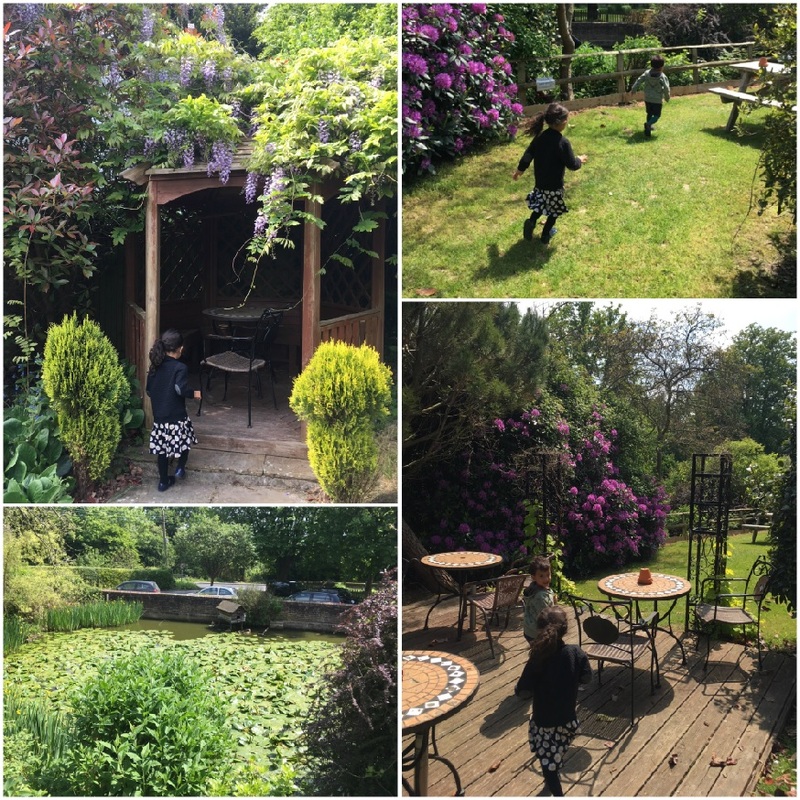 It's such a pretty pub with loads of outdoor space, lovely flowers in their garden and even a pond with ducks which delighted the twins! When we arrived the weather was a bit gloomy so we chose to sit inside so the kids wouldn't get cold. Inside it's proper old pub style with the low ceilings and dark wood with candles and old pictures on the wall, we loved it. The menu was interesting with the usual roast offerings (and my favourite addition - cauliflower cheese included) and various other main options but what really caught my eye were the puddings - more on those later! We all opted for the roast with everyone having beef but I chose the pork belly as they said it had a crackling skin. The roasts cost £13.95 and the kids shared a small portion which was £9.95. The first thing I noticed was the roast potatoes, they looked perfect, not greasy or too over done but properly fluffy inside and crispy on the outside without being tough. Loved them, they're definitely in the running for my favourite roasties! There was a massive Yorkshire which was slightly overdone for my personal taste but still good and fresh. The beef was served rare and the piece I tried was lovely, Mum said some bits were a bit tough and I did have trouble cutting one of Priya's slices as it was quite grisly but the rest was delicious, nicely cooked and moist. I had been prepared for my belly pork to be a bit fatty as it is that kind of cut but it was pleasantly meaty with minimal fat. Unfortunately it was excessively salty, I suspect due to trying to crisp up the skin but I couldn't really taste the meat for the salt and it seemed to make my whole plate quite salty too and Mum thought hers was also on the salty side due to her gravy. The veg was all cooked perfectly, we had parsnips, carrots and greens including cabbage which I love. The cauliflower cheese was perfect, really cheesy and also well cooked - all the veg had a good bite to it. 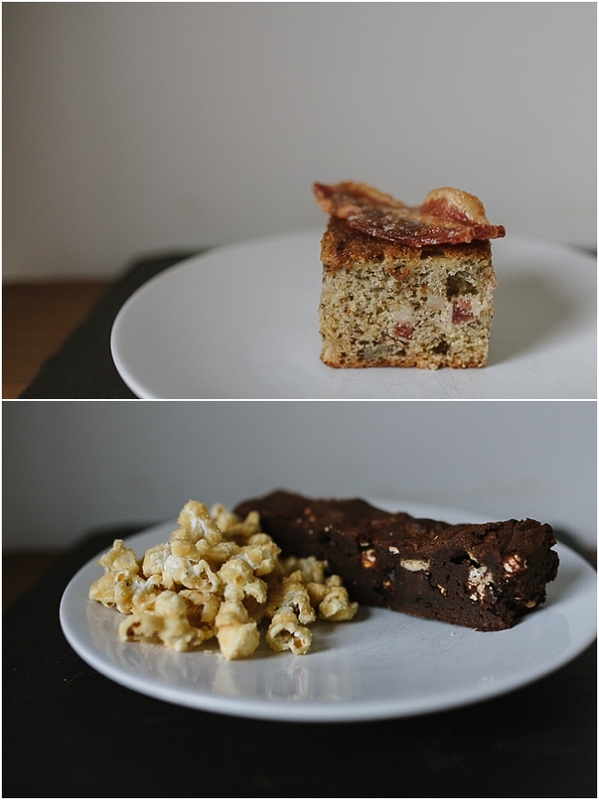 As for those puddings, when I saw there was a banana and bacon cake I had to try it! The kids weren't going to last much longer though and my brother wanted to get on the road back up north so I asked to take one away and got a brownie for Nik too since he'd been off studying all day again. (Plus I really wanted to try the salted caramel popcorn brownie!) They're usually served with ice-cream which I would have swapped for cream anyway but the chef very kindly wrapped up all the usual extras that came with each pudding (apart from ice cream of course) so the banana & bacon cake came with a treacle sauce and a slice of sweet bacon on top! The brownie came with a side of toffee popcorn and salted caramel sauce. I tried to get a decent photo of them at home but didn't have much time and I'm sure they would have been presented much better had we been able to eat them in the pub. Both desserts were £6.95 each. I absolutely loved them both - we shared half and half! The cake wasn't overly bacony but had a nice saltiness to it with the banana and the treacle sauce was lovely. The brownie was nicely gooey and the salted caramel sauce so good! I definitely rate their puddings highly! The twins weren't at their worst but I did have to take them outside for a run about in the garden at one point. They loved it out there and the sun was shining by this point so it looked very pretty too. I'd love to go back on a more relaxed Sunday to chill out in the garden for lunch when we're not in so much of a rush. It wasn't that busy when we arrived but service was a little slow and when we ordered we asked for the bread asap for the kids but it came with all the other meals. They were very friendly and we were asked how our meals were but it was difficult getting anyone's attention. When we needed a new fork as Priya dropped hers (and also decided she wanted mayonnaise plus we needed some water), we had to go through to the bar area to ask for everything, despite being able to see lots of staff behind the bar, we never managed to catch anyone's eye. Overall, I'd recommend it, the menu was interesting and varied, the food was well cooked and with the exception of being a bit over-seasoned on the day we went, delicious. The Inn is stunning with lovely big outdoor areas and very well kept. It's on the more expensive end of the scale but worth it in my opinion.